Kim Starr is the preeminent painter of Romantic Realism. Her meticulous attention to detail, combined with the artistic sensitivity of earlier masters, results in contemporary works of unparalleled beauty. Critics have said that Kim’s work elicits an immediate emotional response. Viewers are drawn into the image and surrounded by its elegance. It is obvious that they are in the presence of a modern master. In the last 25 years, Kim Starr has created classic paintings and works on paper for corporate and private collections.Her extraordinary art hangs in public spaces, world-class resorts and homes throughout the world.The success of her exhibits has been overwhelming. For much of her life as a painter, Kim Starr created her art in a serene and beautiful village on the Island of Kauai. Inspired by this paradise, she revealed in each of her new works a unique combination of rare artistic vision and painterly technique. Today, Kim continues to create jewel-like masterpieces dividing her time between a small community in the Northwest and her beloved Hawaii as collectors everywhere continue to seek out and acquire these works. 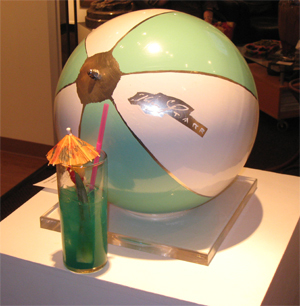 "Race Plane - Precious Metal"
"Beach Ball at Koloa Point"
"Blue and White striped Beach Ball"
"Apple and White Beach Ball"
"Beach Ball at Poipu Beach"
"Aqua and White Beach Ball"
"Blue and White Beach Ball"
"Model at Sunset Beach II"
"Model at Sunset Beach I"
Please email the gallery to view more works by Kim Starr.